Winner of the 2013 Goldsmith Book Prize. Now in paperback with a new Afterword. To purchase please click here. "Fascinating and provocative...MacKinnon forcefully and passionately urges us to stake out our Internet rights before governments or corporations completely take those rights away from us." "A growing number of people throughout the world are counting on the Internet to move their countries in a more democratic direction. Consent of the Networked describes what's happening, successes and failures, what's next, and what needs to be done. It's the real deal." "For nearly a decade, Rebecca MacKinnon has been at the center of evolving debates about how the Internet will affect democracy, privacy, individual liberties, and the other values free societies want to defend. Here she makes a persuasive and important case that, as with other technological revolutions through history, the effects of today's new communications systems, for human liberation or for oppression, will depend not on the technologies themselves but rather on the resolve of citizens to shape the way in which they are used." In Code Lawrence Lessig establishes that code is law and network architecture is politics. 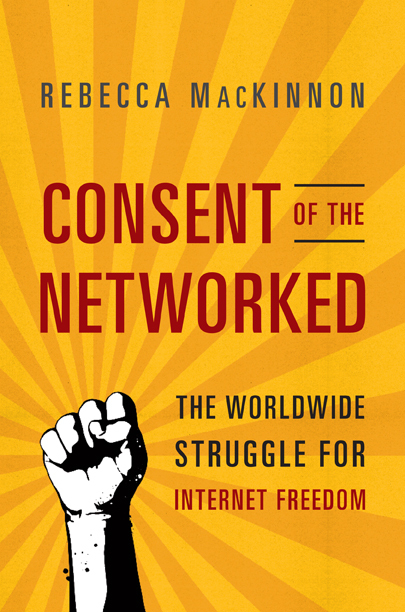 In Consent of the Networked, Rebecca MacKinnon becomes the modern day John Locke calling on those who control the code and architecture of the networks to understand, take responsibility and acknowledge the requirement for the Consent of the Networked. Consent of the Networked will become the seminal book defining this fundamentally new and important way to think about the future of citizenship in the digital age. "Consent of the Networked is a must-read for anyone interested in freedom of personal and political expression in the 21st century. It's accessible, engaging, and periodically hair-raising. It should have the same impact on public awareness of the vital issues surrounding Internet freedom that "An Inconvenient Truth" had with regard to climate change." "Rebecca MacKinnon brings clarity and reason to the often fraught debates over the internet's social and political consequences. Hers is a voice to be listened to."